Iâ€™ve never had a hallucination before.Â Iâ€™ve been delirious from fevers before and thatâ€™s certainly a trip, thinking that Iâ€™m somewhere else, doing something else.Â My personal favorite is the one where Iâ€™m really thirsty and so I get up and get a drink, only itâ€™s my mind that thinks Iâ€™m doing it, so then I actually get up and get a drink, only itâ€™s still my mind and that just goes on and on until I finally fall asleep again.Â Hallucinations would be fun and thereâ€™s a new chance for you to see inside the life of someone who starts getting them all of a sudden. 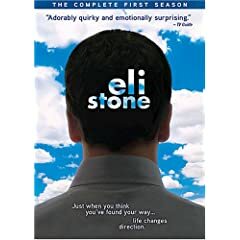 Starting this September 2nd, now available on DVD from ABC Studios and Walt Disney Studios Home Entertainment comes the first season of the most original legal drama in a long time.Â Eli Stone â€“ The Complete First Season is ready to burst into your living room with all the auditory hallucinations and legal drama you can handle.Â Bring home this groundbreaking series today! Eli Stone, played by Johnny Lee Miller, is a high-powered associate attorney who graduated top of his class at Stanford and clerked for Ruth Bader Ginsburg.Â He is now at a top-notch firm in San Francisco, living his life, having everything, getting engaged to the bossâ€™s daughter.Â Then he starts hearing George Michael songs and seeing him in his living room or the lobby of his law firm and Eli knows something is wrong.Â It turns out he has a clot in his brain that is causing these visions, but Eli believes that maybe heâ€™s a prophet sent to help people out.Â His visions keep directing him to people he can help and his acupuncturist helps him fill out the details.Â With Natasha Henstridge as Eliâ€™s fiancÃ©, Victor Garber as the senior partner and Loretta Devine as Eliâ€™s secretary, this is a star-studded and hilarious show which will take you places. The special features included in this DVD set consist of an extended pilot episode with optional audio commentary, a selection of deleted scenes, a reel of bloopers, a featurette of Natasha Henstridge, a look into how the special effects were made, a featurette which explores the creation of this show and a look at George Michael on the set. Once again, this show is an example of advertising that completely misleads the viewer as to what this show is all about.Â The show is far more serious and complex than the goofy trailers would have us believe.Â Eli struggles with a father who ruined his life and the realization that he is suffering from the same affliction that wrecked his father.Â The talk about God and social justice is a little hokey and designed to not offend anyone, but the messages are good ones.Â This show takes serious looks at the war in Iraq, the struggle of illegal immigrants, the role of corporations and big Pharma is destroying American lives.Â This is a lawyer show with some serious soul.Â I recommend this show without a momentâ€™s hesitation. This Stone will keep on rolling. This DVD set is available at Amazon.com. 1 user commented in " Movie Review: Eli Stone â€“ The Complete First Season "
This show is so good! The hallucinations are so funny and it’s hysterical how he carries his daily life surrounded by George Michael lyrics! You have to watch this show! Get the 1st season DVDs and remember to watch season 2!! !